I had a wonderful morning in the studio with special guest Lynn Elmhirst (Executive Producer from Influence Entertainment). 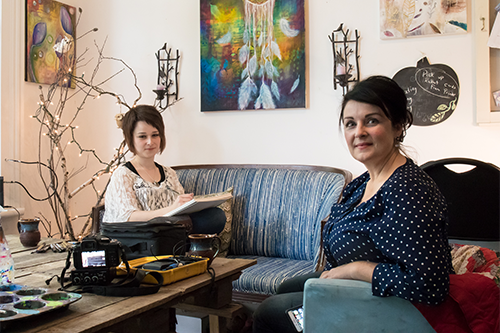 Peterborough & the Kawarthas Tourism is engaging TV & Travel Journalist Lynn Elmhirst to create a series of 6 short videos on “Meet the Makers” featuring artisans in our region. It is an honour to be included with such a fantastic line up of artists they have in store for you. Release date for this exciting project is set for November, stay tuned for some great videos coming your way! https://briannagosselin.com/wp-content/uploads/2015/10/MeetthemakersBG_Lynn-Elmhirst-7529.png 333 500 admin http://briannagosselin.com/wp-content/uploads/2018/05/Untitled-1.png admin2015-10-13 19:06:432017-08-18 11:29:01"Meet the Makers"